A Lakota LQ. That's a Lakota, Living Quarters horse trailer; A Cowboy 'home ranch' cabin, shelter on the road, and horse trailer all in one. Locking down Home base quarters was one of the biggest changes I've made. I moved from the Old Jayco Eagle Fifth Wheel to a brand spanking new Lakota three horse LQ. The old rig still has a few miles left in her but even if they were small little miniatures... there's just no place for a horse in the Jayco! I'd thought about this rig for some time, but due to its high dollar nature I kept finding excuses to put it off. I told myself I couldn't afford it. ...so I pulled the trigger and went after a deal for this Living Quarters trailer... that will be among other things, the housing on my winter camp. I must admit, I was expecting the money boys to laugh at my application, but I guess I held my ears right because it sailed right through. The people at Dixie Horse and Mule in Newton Alabama done me fine! Many thanks to them for getting me the deal for my new home! In the end, I finally agreed with myself that I couldn't NOT afford it. Life is only so long and you have to live it as it comes! You have to grab it and squeeze all the juice out of it right now! Not some time down the road when times might be better. No sir! Times get better when you MAKE them get better. So now, when I get back to that patch of Arizona where I'll be building my Winter camp/home base I'll be living in what for a cowboy is pure luxury! Truth be known, outside of the Horse compartment, an LQ Trailer is just the same as any normal RV. They are totally self contained, with all the amenities, including air conditioning that a person might need. I've got water heater, Full shower, Full size double door (if small) refrigerator, full kitchen and a nice "leather" couch! The main differences might be, you usually have a much smaller living space, and the tanks tend to be smaller. 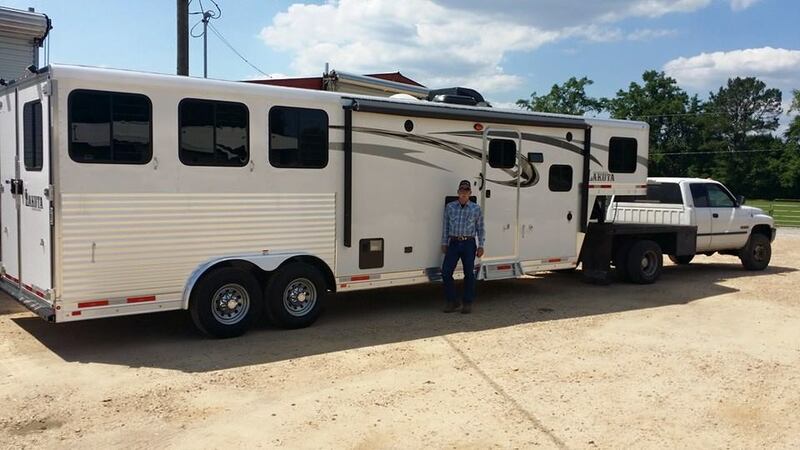 This is generally, I think, because most of them are designed for "Weekend" length use at Rodeos and Horse shows, and... most of them are used in that sort of environment, where they are "plugged" in to "RV Hookups". Smaller tanks only mean you adjust and plan accordingly. If you've the dinero to buy the trailer and the truck to haul it, you can get LQ's with slides to give greater space, longer shortwalls and whatever tank size you want... buuuut... those COST and get awful long and require a Class 8 Truck to drag 'em around! The rig I've moved into is perfect for me! One thing I should say regarding moving to this sort of rig from a standard RV; There's a bit of a learning curve you need to climb in readjusting to going down the road hauling horses. After so many years boondocking in a standard RV I've gained some built in habits that don't work so well any more. I can no longer use Wal-Marts for overnight stops ;) If you think folks grouse about RV's in the parking lot... just think of the cacophony they'd raise over a few piles of road apples decorating the asphalt! So that took some conscious and deliberate changes in the way I think. I can't just go without a plan any more. I've got to have a fairly decent idea of where I'm going to make it possible to hunt up overnight stabling along the way. One term of "identification" you will see everywhere in regards to LQ Trailers is Shortwall. The horse stalls are arranged in a "Slant Load" configuration. The front wall of the Horse compartment is the rear wall of the LQ (Living Quarters). Since it is a slant load, that wall is angled. One side (The road side) is shorter than the curb side wall. That shorter wall is referred to as the "Shortwall". All LQ "sizes" are based off that dimension. They make LQ's as short as a 6 foot shortwall. That loss of length though eliminates a lot of livability. They're ok for an overnight or a weekend, but even for fellas like me, they're really too small a space for most people to consider for a full time home. Even the 8 footers are a bit tight. Once you get to 10' living quarters you start getting the full size refrigerators, better sized bathrooms and enough closet space to put your possibles away. I've been living in this Lakota now for something over two weeks and I can honestly say I've not found one thing about it that's disappointed me. In living space I dropped from the 280 or so square feet I had in the 30' Jayco for something better than the past five years to around 170 square feet in this Lakota. Now most people I expect see that and think; Oh.My.God! I could never live in such a tiny space! I'm loving it. The living quarters trailers themselves, I've found, are built with a hell of a lot more durability and quality than the RV's you see rolling down the road. The only fault I've yet gained to complain about is the waste tanks. They are -not- insulated. So... in the event of freezing weather you'll need to do SOMETHING to keep those from freezing. (a jug of RV antifreeze should do the job). The fresh water tank is inside the heated living space so It's protected. As Time goes by I'll get quite a few pages added to shorten the learning curve of traveling with horses with a Living Quarters Trailer.